Walter Salas-Humara and Jonathan Lethem met at a Silos gig in New Orleans. Jonathan describes, "I'm a two-decade Silos fan, and have seen Walter play in the various incarnations of his band eight or nine times over the years. When I introduced myself to him it was in the interest of sending him a few of my books, just as a token thank-you for his music. We got talking about writing some songs together. I hardly thought Walter needed help in any sense; he's one of the great American songwriters (see: "The Only Story I Tell", "Susan Across The Ocean", "I'm Over You" and so many others...) but I was flattered at the idea of supplying a Silos lyric or two. Walter, however, surprised me, and delighted me, with the focus of his intent -- he wanted to write a whole album with me, from the ground up, and to get outside his "Silos voice". We began writing and the result was sort of explosive -- giddy pop songs and mournful blues that came from their own strange angle, not quite like what either of us expected." Walter adds, "I loved Motherless Brooklyn, but after reading The Fortress Of Solitude, a book I consider a stone cold masterpiece, I knew had to work with Jonathan. We carved out a couple days and met at his house in Maine. I hoped we would get a few things down and I was totally unprepared, and completely blown away, by the speed in which Jonathan gets ideas on paper. We would discuss the framework for a tune and he would be writing while we were talking. Then minutes later he would have several verses with internal rhymes, a chorus and a bridge. I was completely on the spot -– I now had to come up with melodies just as fast. We ended up with eleven songs at the end of day two. We decided that the project needed to be more than just an album of songs, and over the next week Jonathan emailed me several spoken word pieces. I recorded these with just voice, and the songs I recorded very bare bones, just voice, a single guitar and a simple drum beat." Jonathan continues, "The second act in the construction of I'm Not Jim was our expansion from a collective of two into a collective of four (it's worth saying we're not only "Not Jim", we're also "Not A Band", but rather some kind of floating workshop or lab for making music -- Walter is our only public voice and face, and I don't play any instruments). It happened because Walter thought The Elegant Too (Philip Hernandez and Chris Maxwell) would be able to add some distinctive production to the tracks he'd laid down. Of course it became much more -- Chris and Phil warped and enriched the music so completely that halfway through we realized we'd really entered a four-way collaboration. Not quite Mick meeting Keith on a train platform with an armload of blues records, but perhaps almost as fun." Walter concludes, "The Elegant Too took just my vocal tracks and built the thing from the ground up. Sometimes they used the same chords and beats I had played, but more often they subverted the melodies and juxtaposed different chords and beats to create new combinations. It's a remix album without having an original release. It's an original re-mix. Finally, by another small world convergence, Jonathan is good buddies with one of my high school classmates I hadn't seen in years, the painter Kent Matricardi, so it was completely natural to enlist Kent to do the album artwork." So what exactly do these songs sound like? Lethem and Humara’s songwriting takes the ordinary pop, folk, or blues song and makes it the occasion for what you might call ‘serious play’—every lyric is grounded in emotion, but emotion twisted by language and wit into something recognizeable but new. The melodies that spring from Walter’s voice fitting itself to these unexpected syllables push the strength and warmth of his Silos work to a new range, sometimes featuring a Dylanesque self-consciousness or humor, sometimes a Nick Drake introspection. And when the skewed brilliance of the songs meets the paisley-pop-electronic-remix chops of Maxwell and Hernandez —The Elegant Too—the result always cuts against simple interpretation, pushing all the charm toward menace, and the sorrow toward ecstasy. Walter Salas-Humara was conceived in Havana, born in New York City and raised in Southern Florida. He has made New York City his home for the last 26 years. 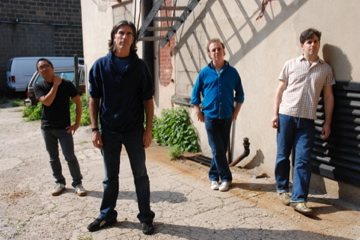 In 1987 his rock band, The Silos, was voted Best New American Band in the Rolling Stone Critics Poll and over the past 21 years has recorded 12 albums and put in thousands of days on the road. Jonathan Lethem is the author of seven novels, including You Don’t Love Me Yet and The Fortress of Solitude. Motherless Brooklyn, his fifth, won the National Book Critic’s Circle Award, and has been translated into twenty languages. Lethem also the author of a story collection, The Wall of the Sky, The Wall of the Eye, and a novella, This Shape We’re In. As editor, he created The Vintage Book of Amnesia, guest-edited The Year’s Best Music Writing 2001, and was the founding fiction editor of Fence Magazine. His stories and essays have appeared in The New Yorker, Rolling Stone, Esquire, The Paris Review, and a variety of other periodicals and anthologies. He lives in Brooklyn and Maine. The Elegant Too are the music production team of Chris Maxwell and Phil Hernandez. They began working together in 1998 when Phil, freshly divorced from Brave Combo, was working as a drummer/DJ in New York City and Chris was writing and playing guitar in Skeleton Key. They've done remixes for P-Diddy, Mace and The Lox and their production credits include Shivaree, Yoko Ono, Ray Davies, John Cale, They Might Be Giants, Blues Explosion and Tiny Masters of Today.